This image is courtesy of June Smith (Joseph S. Smith Jr.) June is a nickname for junior. album from the 1920's. 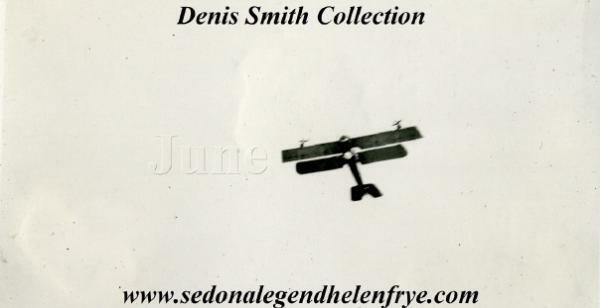 Thanks to his nephew Denis Smith for sharing it with Sedona Legend. and Jerry Tabnac, one of the best camera men in the country, along with Sam Greenwald. plane and 'MacDougall' on the Cat sweater. Team were as it seems several original members have their own recollections. Cats who were never official members. front of the Burdett offices in Los Angeles. embellished and facts are sometimes blurred. This is compounded by 86-some years of reprints. indepth Black Cat info and images can be found through various media sources. uncovered in newspapers. Likely, of course, there was another “first” event in Ken’s mind. 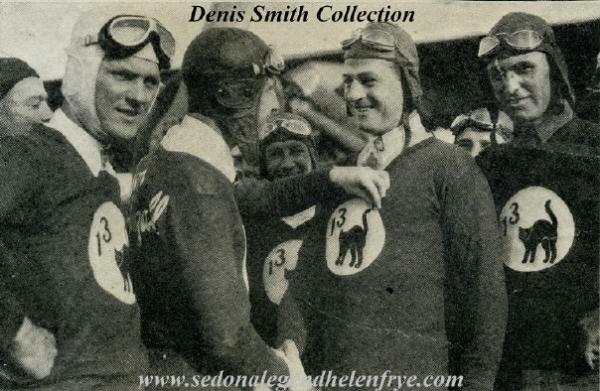 founding members being prominent skilled Burdett pilots. cultivate any possible avenue of revenue to pay the rent and put dinner on their tables. stunt team was born and invented. MacDougall, Ken Nichols, and Spider Matlock, with MacDougall serving as leader and president. date closer to Smith and Nichols of 1924/25 for the formation of the Black Cats. management and a close friend of most the early members. This man was Burdett D. Fuller. make sense of Burdett Fuller’s sentiments. Black Cat group. At that time additional pilots were included one these being Paul Richter. History documents many other men, to include Jack Frye, as founding members, as well. corresponded to 13 men at the last supper. careless death-defying daredevils. 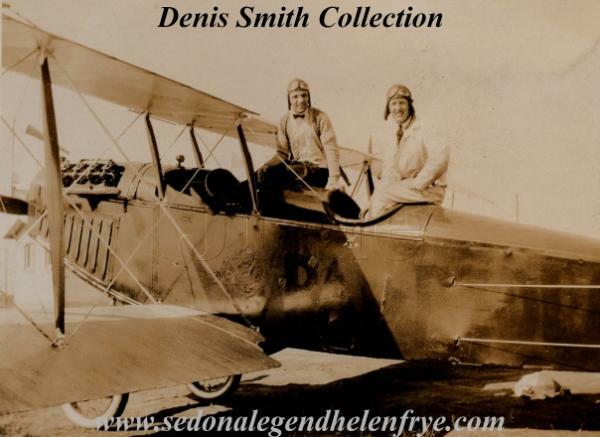 Some members were “straight pilots” as Frye and Richter. as a pilot and not a risk taker on the wings of planes or hanging from them in flight. responsibility. 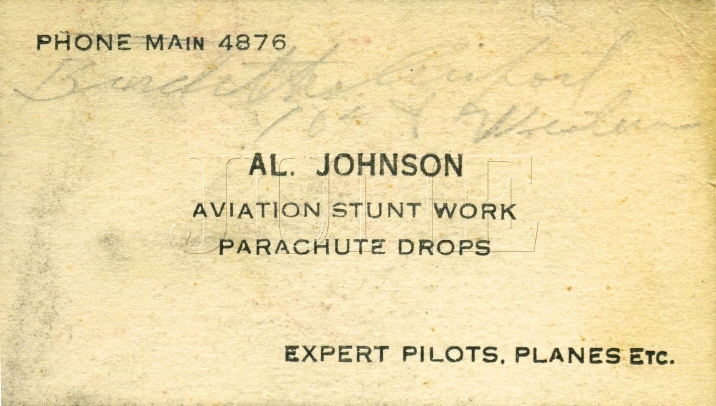 He was a aerial stunt man but he was not careless with spectators or passengers. the fabric of Standard Air Lines and TWA. unnecessary accidents. My point of view comes from an admiration of TWA's Legacy of Safety. 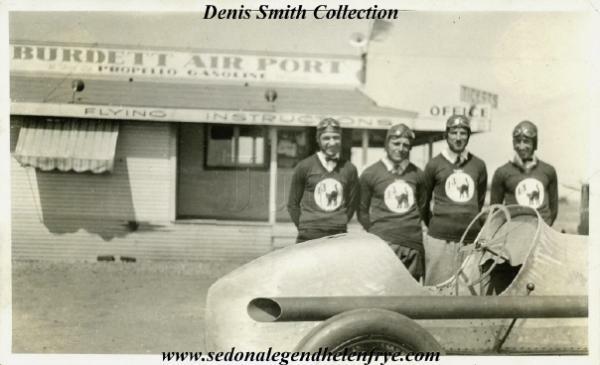 photographic collection of June Smith. 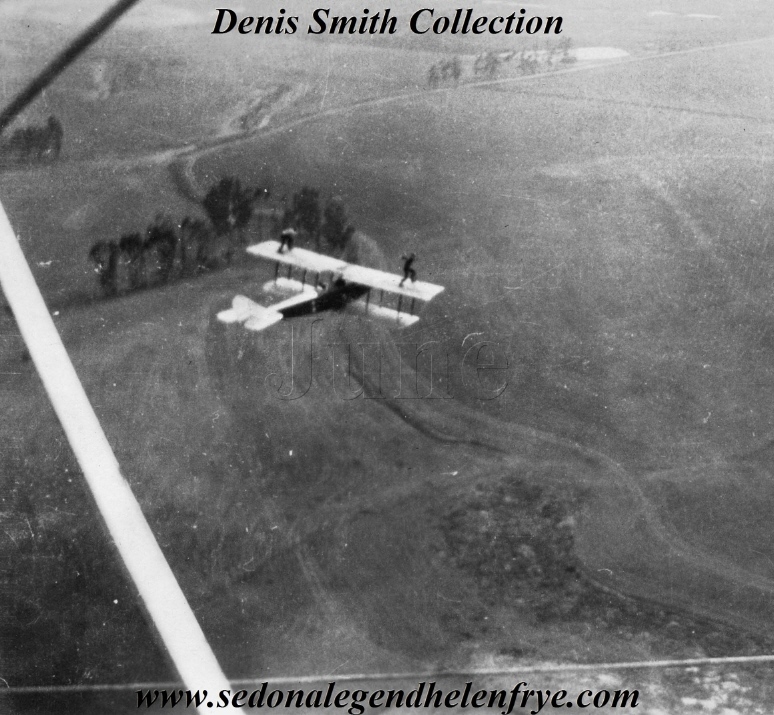 These images submitted by his nephew Denis Smith. The Black Cats performed many stunts, some relatively tame, but others extremely dangerous. endorsed the creed, “We’ll Do Anything” for a price. although keep in mind they did a little bit of everything. *Flying through a building- or crashing into a building, ocean, trees, or objects, etc. on the upper wing of Bon’s plane; a stunt unheard of up until then. daredevils regularly raced these exciting pocket rockets. (See image at top of page). to stop was by Spider and Fronty hanging from the wings and dragging their feet on the turf. to pick up Nichols and Matlock, after which, they finally took off for Los Angeles. only good omen of the cursed trip was they made it home without any deaths. Matlock’s first jump, something he was not forthcoming about at the time. from the side of the building, where his head harshly contacted the wall. Ouch! Black Cats are typically lithe creatures, right? didn’t even know that tires went flat. Imagine that! they are off the ground and in pursuit of number 27.
pin. This feat all carried out with nothing under her but 2000 feet of empty air! heroes were inundated by a pressing crowd of over 500 impressed spectators! misadventures and a skilled licensed pilot to boot! 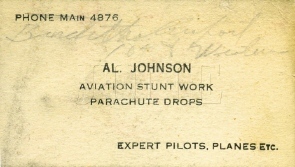 the kind of work Jack Frye usually did with the group (piloting one of the 2 planes). flying. Never would I have been able to dream that one up! lumber. Talk about a 13 Black Cat tale to top all others! "Live to fly another day, I say!" result was a bad hair day and a lot of split ends. He plummeted to his death. one recorded on October 25, 1925, for the Movie house Newsreels. Depression) and the Black Cat saga was not all glamour and glory. perform the dramatic feat for the overzealous Hughes. and released sacks of “lamp black” over fans which spewed the soot out to simulate smoke. many shoots). The death shot was left in the movie as filmed by 3 different camera ships. had safely floated “merrily” to the earth while his passenger was trapped in a fatal dive. his license for 3 months and fined him 500 dollars. The accident haunted Wilson from then on. day). In the company of the Black Cats though perhaps safety is just a moot point. disappointed at the reaction. Nichols and Richter were great pals. Young Idiots Endanger Lives of Thousands”. In a stunt for the annual Stanford versus U.S.C. stadium and drop parachutes with footballs of both school colors, as painted and sewn by Mrs.
run out many times over and it was time to disband with what was left of their fleeting 9 lives! from severe high voltage burns. to a hot shower and a good night’s rest. collapsed to the ground amid the screams of a horrified film crew and shocked bystanders. Minneapolis. Gladys Roy at only 25-years old had experienced a lifetime of aviation. was very much a part of the Burdett Airport hierarchy- a terrible blow to his Black Cat peers. and one of their boys was in the bleachers that day watching but didn't see the actual crash. saw this as a comeback and wasn’t looking for money. Another needless freak accident. Cat when he died December 11, 1970, at Sun City, California. the colorful fabric of the dawning of American aviation. Bless you Cats! You are not forgotten! Black Cat Spider Matlock with unidentified companion in Paul Richter's plane. Notice the P.E.R. Airport flight shack (notice the Burdett windsock and office behind plane). Goebel. (Fuller is the questionable one). This image is from the June Smith archive (1925). Richter with Spider Matlock, front, (1925). Notice the Richter emblem on side of plane. Art Goebel. Front row, Al Johnson, Herd McClellan. Research is still pending on identification. If A Black Cat Can't Do It- It Can't Be Done! on this generalized list, and I will expand the names as dots are connected. Just a couple Black Cat business cards from the June Smith Collection as seen on Page 1924. Paul E. Richter, Jr. and William "Spider" (W. E.) Matlock. Click for larger files. found on Page 1924. Albert Johnson, longtime Hollywood stuntman, and Kenneth "Fronty"
Nichols, the Black Cat with the most infectious personality and the biggest smile. forever. I am humbled. 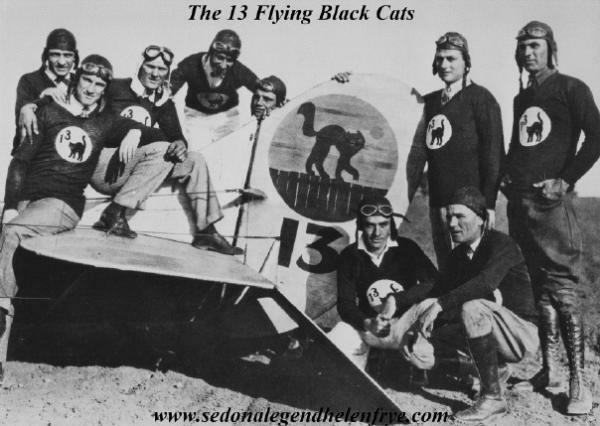 "We were.... we were the 13 Black Cats!" Nothing else need be said. last thing that I remembered was the look on the pilot’s face as I shot by him. the compliment.” Additional info please see Page 1926 "Events in and Around Burdett Airport". way to work at the (Howard Hughes' Hell’s Angels filming location).